One of Leduc's premier events of the year has once again come and gone, but the memories will last for a very long time. 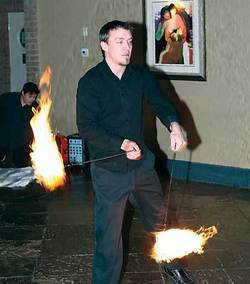 The 2012 Leduc Regional Chamber Gala, themed "Fire and Ice", was a smashing success, with the event being a complete sell out almost a month prior. There was much anticipation to see who would be taking home one of the seven awards that evening, but before they were announced, the stage was set to perfection for a gala like no other. Guests first entered the Executive Royal Inn down a red carpet lined by firefighters in dress uniform, where they then encountered gaily dressed dancers stepping, kicking, spinning and twirling ribbons leading them on toward a bar set up in the center of the foyer/aisle where all of the mingling was taking place. A large ice carving emblazoned with images of snowflakes and flames surrounded the logo of MNP, who were the sponsors of the free glasses of champaign that were available to all of the guests. A fun and complimentary photo "booth" was set up on the far side of the bar and all the guests were encouraged to have the evening captured with a professional photo. Silent auction items were spread out on tables surrounding the main bar area, and there was quite a bit of competitive bidding going on for the many popular items available. Of particular interest to the ladies in the crowd were the white gold and diamond hoop earrings worth $1,600.00, donated by Leduc Goldsmiths, that would be awarded at the end of the night in a ticketed draw. One surprise the Chamber ladies had kept very quiet really wowed the crowd as the lights dimmed in the foyer, music with a very heavy beat began to play, and a fire dancer lit his torches and began to swing them around in an amazing display of artistry and dance. And all of this happened before the doors to the main ballroom were even opened! Once the double doors swung wide a flurry of gorgeous gowns and black suits entered a transformed ballroom which was swathed in red satin chair covers and silver tablecloths, draped in crystals, glitter and tulle, and bathed in a warm red glow throughout. As everyone found their seats, the emcees for the evening, Lee Plamondon and Andrew Canham, did a fabulous job of welcoming everyone and setting the tone for the night. Wasting no time, the first award given was the highly anticipated Service Excellence Award sponsored By Sobey's Leduc. This award was decided by an online voting system where the general public chose the recipient. Over 5,000 votes were received in this hotly contested category, but once they were all counted a clear winner was found. The 2012 Service Excellence Award was presented to Mr. David Bendza who is a long time employee at Canadian Tire Leduc. David can always be found roaming the store, or in the summer time more likely outside in the greenhouse areas, with a smile on his face and a wonderful attitude, ready to help anyone in need. Each award winner was given a dozen boxed chocolate roses donated by Edible Arrangements, as well as a beautifully hand crafted glass trophy in the shape of a flame. The 2012 Farm Business of the Year award, sponsored by the Leduc Co-Op, was won by Soyang Market Gardens. They are the only large scale producer of cauliflower in all of Alberta. Small Business of the Year was awarded to Leduc Goldsmiths, who received two very loud rounds of applause; one when they were announced as nominees and the second, even louder round, when they were announced as winners. The President's Award, which is a special category begun just four years ago under the the Chamber leadership of Mrs. Donna Tona, is a special recognition award decided upon by the current Chamber President. This year's President, Cindy Guy, chose to honour Mr. Murray Hales for his many years of support, promotion, volunteerism, and work that have contributed toward making Leduc the fabulous place to live that it has become. The next award presented was the highly competitive category Business Start-Up of the Year, sponsored by Ricky's All Day Grill: Executive Express, and the very grateful winner was Brambles Ladies Wear. The Young Business Leadership Award, presented by MLA George Rogers and sponsored by Canadian Tire Leduc, was given to Dr. Marie-Alice Mandich of Dynamic Orthodontics, who was charmingly caught off guard by the award and breathlessly accepted her trophy. And last but certainly not least, the final award of the night was the Business of the Year Award. Sponsored by the Leduc Rep, three very worthy businesses were vying for top spot; namely Coldwell Banker Haida Realty, Leduc Co-op Ltd., and The Rental House. Even though all three businesses are definite winners in their own right, the Leduc Co-op proudly took home the prize. Rick Polasek humbly accepted the award and thanked everyone, stating that it was really all about their staff and customers. As in years past, each award was partnered with one course of the evening's meal along with a wine pairing to match. The wines were all sponsored by the Leduc Co-op Liquor Store and Corinthia Liquor Depot. The kitchen staff at the Executive Royal Inn truly outdid themselves with the wonderful repast served this night. Beginning with a lobster spring roll that had a lovely smoky flavour to it, served with a fresh and bright ice wine mango chutney started the meal off perfectly. The second course, in my mind, was the highlight of the night. A wild mushroom and spinach bisque soup with cognac flambé. Simply to die for. The next dish to arrive was an artfully stacked tomato, unripened mozzarella, and basil salad with a balsamic vinaigrette. Then the much anticipated main course was served, and how can you possibly go wrong with a triple A beef tenderloin with roasted baby potatoes and prosciutto wrapped asparagus? Well you just can't. Raves were heard around the room at the quality and flavour of the beef. Finish off the evening with a mouth watering s'more fudge brownie and cappuccino ice cream drizzled with salted caramel sauce and you have a room full of very satisfied diners. The overall service during the meal was spot on, with servers ready and willing to whisk away finished plates without seeming to hover, and each course being served in a very timely manner. All of the Chefs and staff came out from the kitchen area to receive a well deserved standing ovation at the end of the meal, and judging by the big smiles on their faces, the gesture was very appreciated. At the end of the evening, as a thank you for being the honour guard at the Gala and the charity of choice for this event, the Leduc Chamber presented a $500.00 cheque to the Leduc Firefighter's Rooftop Campout campaign to raise funds to find a cure for Muscular Dystrophy. Just before the glittering crowd made their way to the exit, the theme from the movie Rocky started pounding out and, much to the amusement of the crowd, the evening's hosts Lee and Andrew came jogging through the tables dressed as athletes and holding high a replica of the Olympic torch. As they took to the podium they announced that next year's gala would take place on February 22, 2014 and the theme would be "Honouring Our Champions The Olympic Way". So as an early warning to everyone who waited too long to get their tickets this year and the event sold out, do not make the same mistake next year! This truly is an event not to be missed!